➡ High voltage cable glands for electrical installations and circuits with anticipated high fault currents are suitable for terminating i) single core aluminium wire armoured AWA and ii) 3 core steel wire armoured SWA cables, typically distributing 11kV-33kV power. 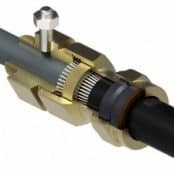 The high voltage cable glands manufactured by Prysmian feature an integral earth connection compliant with GDCD 190 Category A – (43.3kA for 1 second). Suitable for MV-HV cables with outside diameters up to 112mm – weatherproof and waterproof for terminating wire armoured cables in both indoor and outdoor installations with IP66 ingress protection. Thorne & Derrick are the UK Specialist Distributor of Joints, Terminations & Connectors for use with MV-HV power cable systems including high voltage electrical equipment and switchgear with inner or outer cone bushings – cable cleats are available to provide short circuit protection to medium/high voltage cable installations under fault conditions.